Regular visitors to this website will have noticed that the Ray Ford Special has recently disappeared from the Classifieds – For Sale section. That is because the car has just been purchased by Matt Flinn of Portland, Oregon. Matt has asked for our help in obtaining more information about this car’s early years. The Ray Ford was one of the last and best-known of the ‘West Coast Specials’. 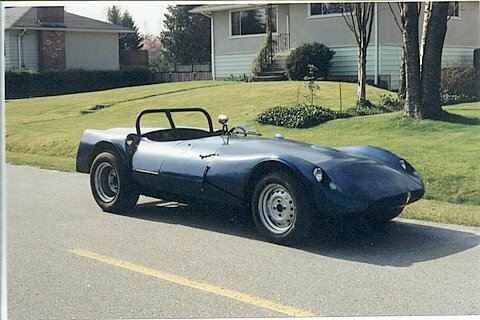 This front-engined, aluminum-bodied sports racer was built in Port Moody by Peter Ray in 1958. It has a Ford (of England) Zephyr six cylinder with a Shadbolt cam, triple SU’s, an MG TD rear axle and close ratio gearbox. During the 1960’s, it was owned and raced by Gord Henderson, who renamed it the Ratel Mk 1, and may have entered it under that name. It was raced at Westwood, Seattle and Portland until 1969. At some point, the rear body section was modified from the original to accomodate larger wheels and tires. Matt has already contacted those individuals who were known to have had personal experience or knowledge of the car, but is hoping that someone else may remember it and be able to provide some additional information that would help him re-create its competition history. Early photos of the car which showed the original rear body configuration would be particularly appreciated.